Guess what I was doing yesterday? The clue is on the balloon!! 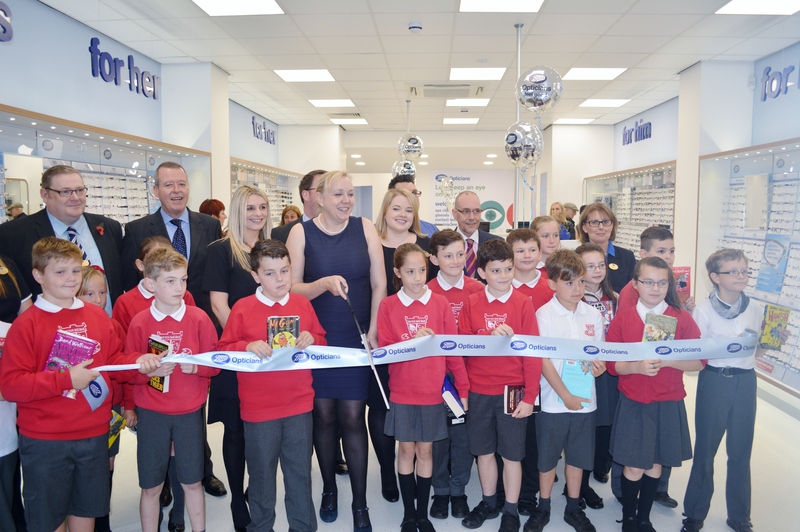 I was guest of honour at the new Boots Optician and Hearing Centre in Helensburgh and had the very great pleasure of officially opening the store – along with P6 of Cardross Primary School (more of them later). There were two reasons why I was asked to do it: 1) Boots and the National Literacy Trust are in partnership to identify the estimated 4.4million children in the UK who have an unrecognised eye problem. The aim is to identify and rectify the problems before it affects the kids’ education – sight = reading, reading = education (and enjoyment of books). I totally support anything that helps children read and enjoy books. 2) I was asked to do it by one of the Directors of the store, Shirley Cameron whom I’ve known since I was about three. Her dad and my dad used to work together and they lived round the corner from us. We went to the same school and have known each other forever. So, thank you Shirley for having me open your new shop for you. I had a ball!! Here I am at the wall of designer sunglasses – they were all designed by P6 of Cardross Primary School as part of the launch of the store. Aren’t they fantastic? It was a young lady called who won, but I can’t remember which is her design on the wall. Well done R for winning!! Here we all are with the books we are currently reading. Okay I’m not actually reading DarkIsle at the moment, but I brought it along anyway. Shirley is on my left and her business partner and fellow Director Rosalyn is on my far right. Here’s me offering to give the kids a haircut! Only joking! Chatting to the kids about reading and writing, reading a wee bit out from DarkIsle. Thanks to Shirley and Rosalyn (and Boots) for asking me to open the store; thanks to P6 and their teachers from Cardross Primary School for taking part in the competition and being so beautifully behaved on the day (the kids were well behaved as well!! ha ha); thanks to hubby for taking the pics and being there despite feeling unwell; thanks to mum and dad, Jane and her parents for coming to support me.